In the midst of a season of holiday treats and decadence, this is what your body is craving. Clean and colorful, this salad will fill you with nutrients without killing your holiday buzz (hey, it’s red and green!). Another plus, this peppery and sweet salad requires minimal chopping and can be put together easily in less than 10 minutes. For a Latin twist, replace the parsley with cilantro, the lemon with lime, and add a bit of minced jalapeño. Toss arugula, lemon, olive oil, salt, and parsley together in a medium bowl. Top with quinoa, pomegranate, and pumpkin seeds. Finish with some freshly ground black pepper and serve. Alternatively, just toss all ingredients together so everything is evenly combined. Woo life got crazy! Culinary school, work and exercise dominate my days, but I’m having the time of my life! New York is amazing and I’m loving the people I get to see every day. Indeed, I no longer dread Mondays :). Dinners lately often consist of practicing recipes from school or utilizing leftovers from class to make new dishes. I’ll also whip up something simple like tonight’s dinner. Raw garlic, radish and celery are very cleansing and are a refreshing way to start the week. Also, using a mandolin makes prep go twice as fast and makes cuts look beautiful without fail. (I love OXO’s Hand-Held Mandoline Slicer, because it’s small and light, but you get three settings and it locks for safe storage.) If you are vegan and don’t eat eggs, I would recommend some white beans cooked with minced fresh rosemary and black pepper. Proportions are not terribly important here, but I’ve put suggested amounts based on what I used tonight. Feel free to switch up the veg as well! Whisk together raw garlic, lemon juice, extra virgin olive oil and salt. Set aside. Assemble the arugula, cucumber, daikon, red radish, carrot and celery on each plate. Carefully crack eggs into individual cups, ensuring that the yolks don’t break. Bring a small to medium pot (depending on how many eggs you’re poaching) of water to a boil. Add a splash of vinegar and a pinch of salt. Turn flame under water down to a low simmer and slowly lower eggs into water. Use a spoon to gather the whites around their yolks. Simmer 3-4 minutes, until whites are set. Scoop eggs out with a slotted spoon and place on paper towel-lined plate in order to drain excess water. Prepare toast and set on plates. Top with poached egg and season with salt. Give the dressing another whisk and drizzle over salad and egg. Finish with some cracked black pepper. *Use a mandolin to quickly make consistent and beautiful thin slices. Battete insieme l’aglio crudo, il succo di limone, l’olio d’oliva e il sale. Mettetelo da parte. Montate della rucola, del cetriolo, del ravanello daikon, del ravanello, della carota e del sedano su ogni piatto. Delicatamente aprite le uova dentro tazze separate, facendo cura di non rompere i tuorli. Fate bollire dell’acqua in una pentola piccola o media (secondo quante uova fate). Aggiungete un goccio d’aceto e un pizzico di sale. Abbassate il fuoco sotto l’acqua, giusto che si faccia poche bollicine. Abbassate le uova e usate un cucchiaio per radunare gli albumi intorno ai propri tuorli. Lasciate cuocere 3-4 minute, finché gli albumi non siano sodi. Usate una mestola perforata per rimuovere le uova e fatele scolare su un panno da cucina pulito. Tostate il pane e mettete una o due fette su ogni piatto con sopra le uova. Metteteci del sale a piacere. Battete l’olio e l’aceto all’aglio un’altra volta e gocciolatelo sull’insalata e sulle uova. Finite con del pepe nero fresco a piacere. *Usate il mandolino per fare velocemente le fette consistenti e belle. I took an eye-opening public class at the Natural Gourmet Institute in NYC a few weeks ago on preparing raw foods. The class was hosted by the famed Renée Loux and everything was incredible. Not only was it delicious, but I felt so clean and light, yet satisfied, afterwards. There must be something to the theory that consuming living enzymes (that is the enzymes found in food not heated beyond 110 degrees Fahrenheit) can be more effective in supplying our bodies with energy and health. I proceeded , of course, to buy the Renée’s book, “Living Cuisine”, and have been looking to recreate that happy experience in as many ways as possible here at home. As much as I loved the raw experience, I think it would be difficult to eat that way all the time (at least at this point in my life), especially in a Northeast winter while also cooking for a guy. I do however, believe that I can incorporate raw and lightly steamed vegetables into the diet much more than I have considered in the past. 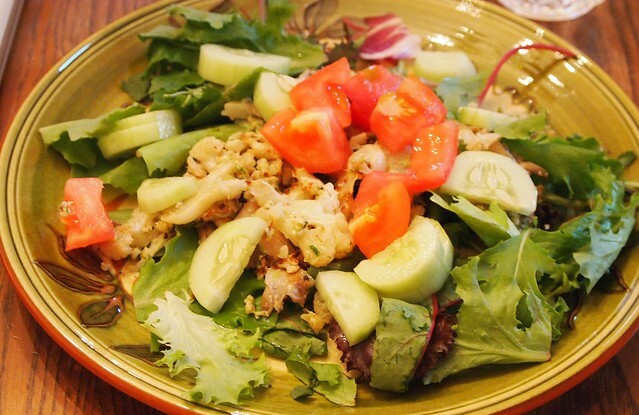 This meal is an example of an integrated approach to raw foods. Whisk dressing ingredients vigorously in a small bowl until somewhat emulsified. Place the scallions, bell pepper, parsley and spinach in a large bowl (the biggest one you’ve got). In a medium-sized pot (preferably one that comes with a steamer basket), fill halfway with water and add a pinch of salt. Bring to a gentle boil and add the squash. After about 5 minutes, when the squash is about halfway cooked, add the kale or collards to the steamer basket on top of the simmering squash and allow to steam for about 3 minutes*, until the greens are lightly softened. Remove steamer, check that the squash is done and strain together. This is a kale salad dressing I improvised when I came home from the gym starving and just ready to eat. (Sorry, no picture as I ate it all too quickly.) Of course, I didn’t want to stuff my face with my boyfriend’s chips and other tempting treats, so I whipped up a quick kale salad and it was actually quite good. Wash and tear kale from stalks and break into bite-sized pieces. Thinly slice half a red onion (shallot would work too) and place in a medium-sized bowl. In a small bowl, whisk with a fork equal parts: flax oil, cider vinegar, Bragg’s liquid amino acids, lime juice, and a half part maple syrup. Pour some of the dressing over the kale, add some salt and pepper and begin to massage. If after about a minute some of the kale is still dry, add some more dressing. (Any leftover dressing can be saved for future kale or non-kale salads- just be sure to consume within a few days as it contains fresh lime juice.) Be careful not to overdo it and cause the kale to become soggy. I massaged mine for about 4 minutes and felt that that was sufficient for me. Sprinkle with pumpkin seeds and feel free to add some halved cherry tomatoes and/or cubed avocado. Serve! Heat oven to 400 degrees. In the meantime, make the pesto by putting scapes into a food processer and running until finely chopped. Add remaining ingredients, starting with two tablespoons of the oil and run. Add more oil until ultimately smooth and incorporated. Set aside. 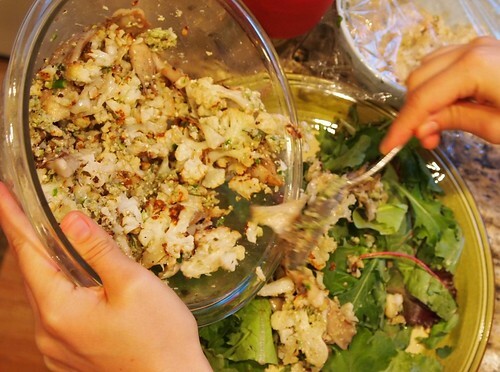 Spray* a baking sheet with oil and lay cauliflower pieces flat. Spray cauliflower and put in oven until browned. 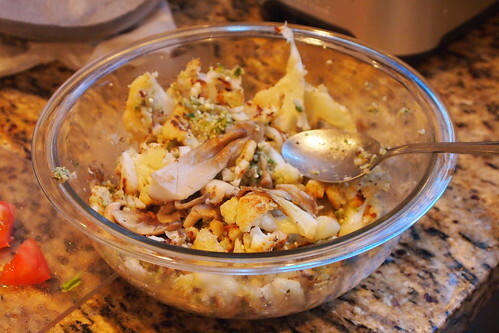 Put about half the pesto in a medium-sized bowl and add cauliflower. Cover with lid and begin to cook mushrooms. 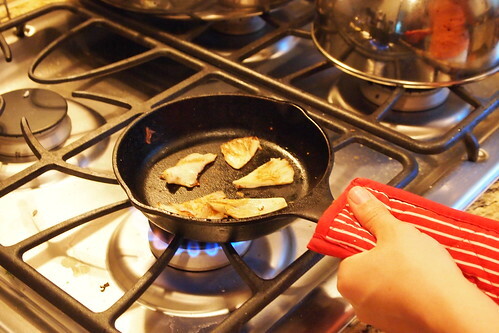 Heat pan or skillet over medium heat and spray or lightly grease with olive oil. Lay mushroom pieces flat (do in batches if you don’t have enough room in pan) and allow to brown. Once browned, flip. Add to bowl. Toss mushrooms and cauliflower with pesto, adding more pesto if you prefer. 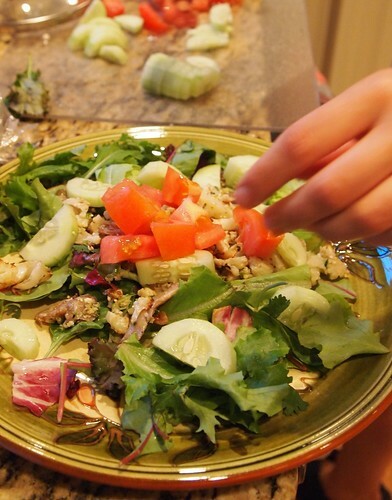 Arrange lettuce on plates, topping with cooked vegetables, tomato and cucumber. Spritz with lemon juice and serve immediately. *I use a refillable sprayer that uses pumping action, rather than chemicals, to spray. If you don’t have one of these, just toss the cauliflower in olive oil.